Rafik Majzoub: Memoirs of a Screw. Poster & Production Stills. 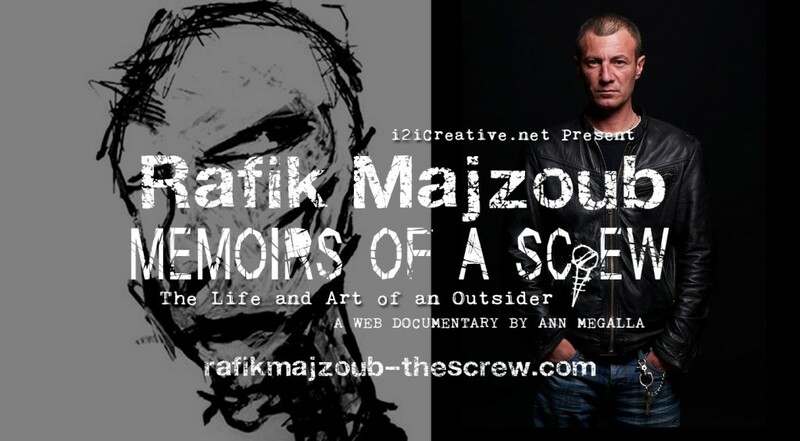 Rafik Majzoub: Memoirs of a Screw. A Web Documentary. In the eastern neighborhood of Dora in Beirut, a place with too many shades of grey for our own good health, there lives a splash of colour in the form of a slight-fragile artist from Jordan, Rafik Majzoub. Now in his 40s, Majzoub’s tale begins in the early ‘90s post-war Lebanon, where a naïve 19 year old college drop-out is looking for his place a world that is also grasping its new found freedom. Little did the self-taught artist know that his paintings and illustrations would illuminate the dark & murky corners of an embattled soul – not just of himself but of a lost generation. In a unique interactive web documentary, we dissect the he anatomy of this cult-like figure, fleshing out Majzoub’s compulsive persona, coupled with the twisted & tormented mentality of post-war Lebanon and “Raw” artistic style such as that of Brooklyn subway artist turned gallery darling Jean-Michel Basquiat. Majzoub’s artistic expression however stands alone when integrating personal, public and political themes, cutting through any false façade to expose the imperfections of life. 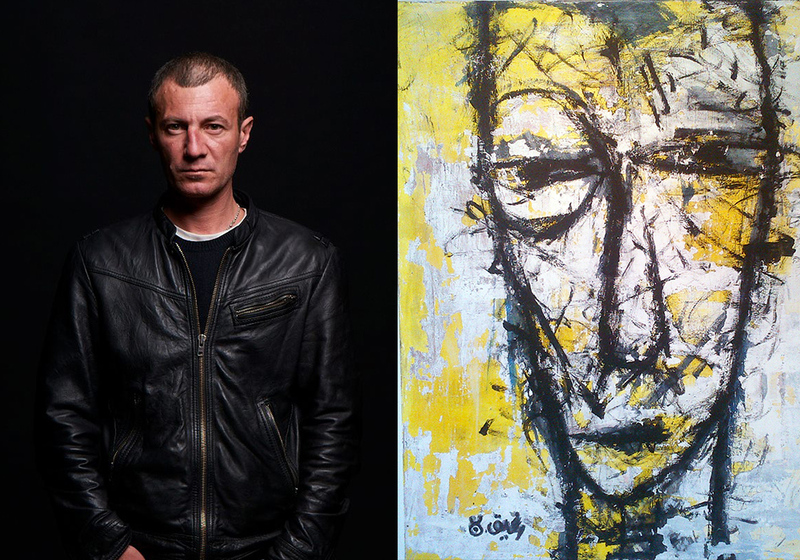 By taking the chances he wanted, speaking his mind and creating artworks that no one before him had ever done in the Middle East, Majzoub rouses a mobilising sentiment amongst Beirut’s underground culture, causing a rift throughout the arts establishment, and a name to be reckoned with among contemporary Lebanese artists. And unlike Basquait, Majzoub lives to tell us the story; taking you on a personal tour through 20 years of his works, giving you a rare insight into the originality of his artistic process and life journey. He describes the near-fatal car accident at age three that set the course of his life. Dropping out of design school in his hometown of Amman and moving to the embattled city of Hamra, West Beirut struggling to earn his keep as a self-taught artist. We taste Majzoub’s first fame as a truth-intoxicating, whisk-drinking, bad-boy artist the establishment will find hard to swallow, yet hard to ignore. The Outsider’s subsequent death defying drinking habits and conflict with loved-ones leaves Majzoub with little else than a shadow of his former self in rehab and a sketchbook filled with rants, embarrassing digressions, drawings and scribbles that in a sane world should never see the light of day. Beyond the whiskey mania, we delve into a sobering, deeper state of mind, an interior labyrinth, where Mazjoub’s caricatured portrait paintings and illustrations are a metamorphosis of himself, charged with his phobias, rejections – the enemy inside. The outpourings of Majzoub’s personal story, imagination, and imagery are of the kind that should be viewed while listening to the hallow voices of Tom Waits and Nick Cave. With disarming honesty, and a voice that is intimately his own, Rafik Majzoub brings us the essential life story to date, frank, fearless and true. 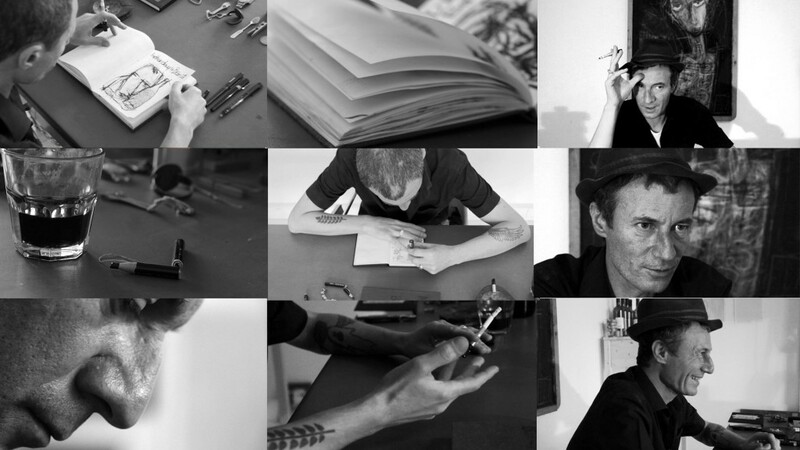 This is an online biography-exhibition created with Rafik Majzoub to explore the breadth of his works over the course of 20 years. 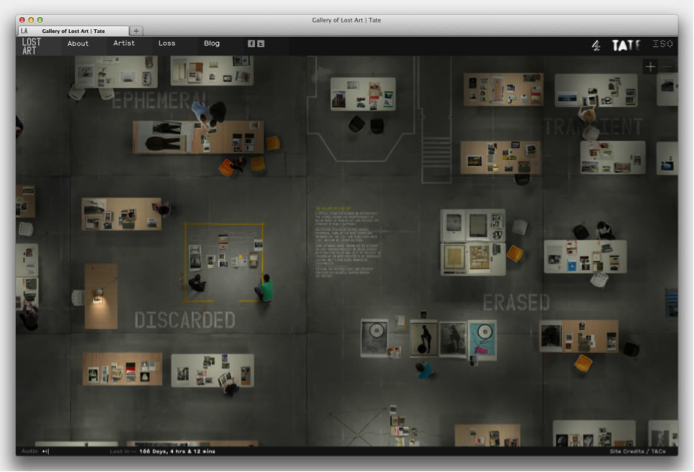 Artwork is presented in an online “gallery” space made up by a series of short-films narrated by Majzoub incorporating media fragments. These include archive painted artworks & illustrations, photography, press articles, reviews, essays, eye-witness accounts. Visitors are encouraged to piece together their own personal view of the work, the context it was created in, and its lasting impact. The interactive gallery is laid out for visitors to examine and contribute to an important part of Middle Eastern art history, giving fresh insights into the art movement of early 1990s in Lebanon and beyond. With your contribution, you can enhance the story-experience by adding more fragments, links and areas of inquiry by re-tracing real locations, places, events and linking people that were part of Majzoub’s world and the arts movement of the time. Visitors Blog area will be integrated into the main site where new work is encouraged to be added weekly and users are encouraged to contribute to an open forum to discuss such as: A. Rafik Majzoub’s art and themes around public memory and art making; B. What does it mean to be an artist in the Arab world now at a time when threats of violence, manipulative politics, and devaluation of values is invasive throughout the region? C. Discuss and debate the constitution of Outsider Art in the 21st Century. The project team and curator also regularly post and are available to answer any specific questions. I am looking for partnership to explore the unique possibilities that the web can offer to documentary creators in re-imagining storytelling. I believe that the ethos of the web – collaboration, constant learning, and iteration — offers a fundamentally new way of producing documentary. Project Support: I am looking for support from people with idoc producing experience to mentor & collaborate the over-all project in best practices, sharing their experiences, their challenges and victories. Narrative design, social media, crowdfunding and marketing implications that follows. Web Designer / Code Sharing: The explosive growth of the web owes itself to the ability of others see and share how the web is put together from a designer’s and coder’s point-of-view. We not only learn how to create original new work but are given a shortcut to creating new work by building on that of our peers. Production Funding: The documentary world is changing as the role of broadcasters shift and audience’s attention is fractured. New methods of supporting the art of documentary must exist on the web if this fledgling genre is to thrive. I welcome production funding through our online portal Kickstarter, grants, festival and lab opportunities. Platforms: Web, Facebook, Twitter, Youtube, Vimeo, Tumblr, Blogs, Press. Regions: MENA, France, Canada, USA. 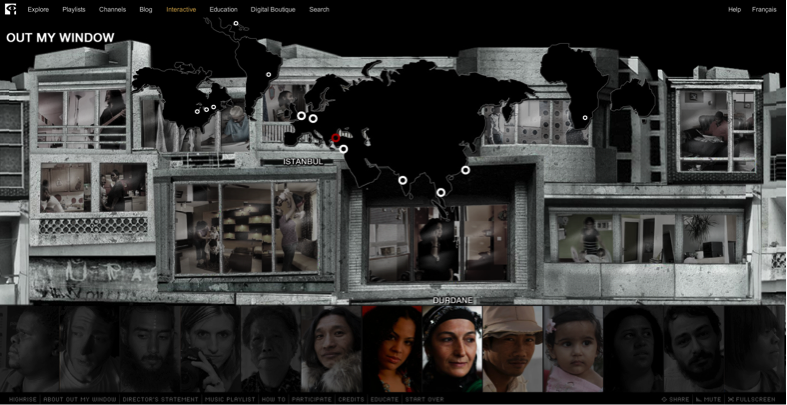 The power of the web continues to break new ground in documentary film. 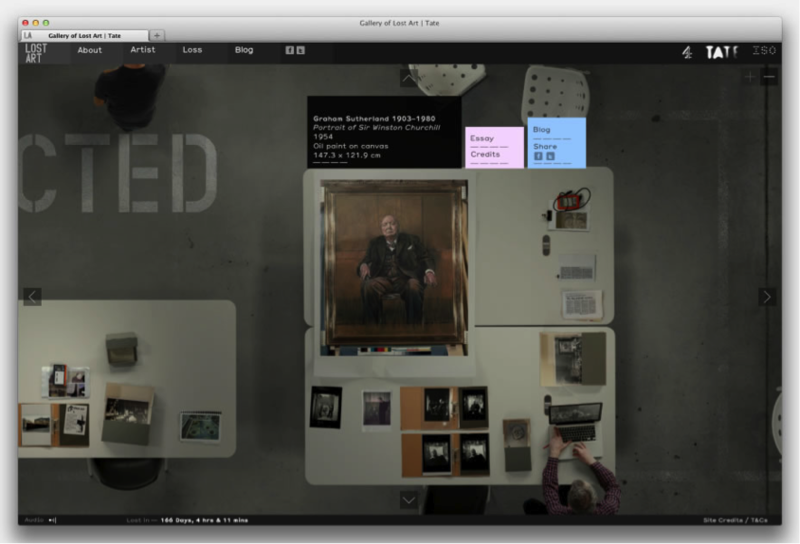 An article in Creative Review July 2012 Straight To Vimeo took my eye, so much so, I delve deeper to learn how the web can act as a facilitator for documentary film production and presentation. I viewed several films mentioned in the article to get a sense of what the filmmaker was trying to achieve when crafting their story. I have embedded some of these films below and include a short summary of the relevant issues affecting or challenging traditional documentary production for online. Also, the article discusses how the internet has become an integral part of the film making process. From announcing the project, research & producing it, to funding, releasing and distributing the final film all happened via the web. London’s Pilgrim Films has raised awareness of issues of marginalized communities across the globe including Vimeo documentary winner for 2012 Amar, which follows a day in the life of a 14 year-old boy in the city of Jamshedpur, India. “As his routine is not unlike the fate of silent millions who lead lives of quiet drudgery in a daily battle for survival. If it makes people stop and think for a moment about their own lives, and how they choose to use their time, then that‘s all I can hope for” says filmmaker Andrew Hilton. In Keith Ehrilich’s (USA) Made By Hand series, considers how something was made, who made it, and where it was made and under what conditions. Making films about the production process under threat from the convenience of modern technology appeals both to the online viewer and the filmmaker, using their skills inherent to traditional forms of production. So does this mean the documentary viewing experience is better off viewed on the small-screen? I still believe the cinema experience of watching films on a large screen, sitting in a dark space, away from distraction, remains my favoured experience. However, the web effect, for documentaries is its enabling well crafted films about niche subjects to connect directly with their audience, finding it’s roots firmly in the internet and removed from the traditional models of distribution via cinema and television networks. In putting your shorts on Vimeo, and having them go out to blogs and other online media outlets, the number of views can quickly get up to the hundreds of thousands. I’m not even sure why TV networks exist anymore, to be honest. 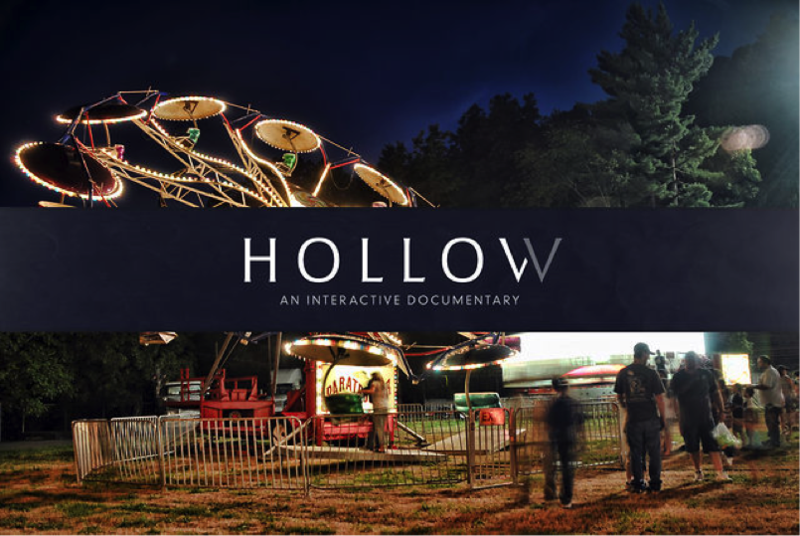 A film can reach more people via the web, both from a funding and a viewership perspective. What do you think? Is television still the ideal platform for documentary?